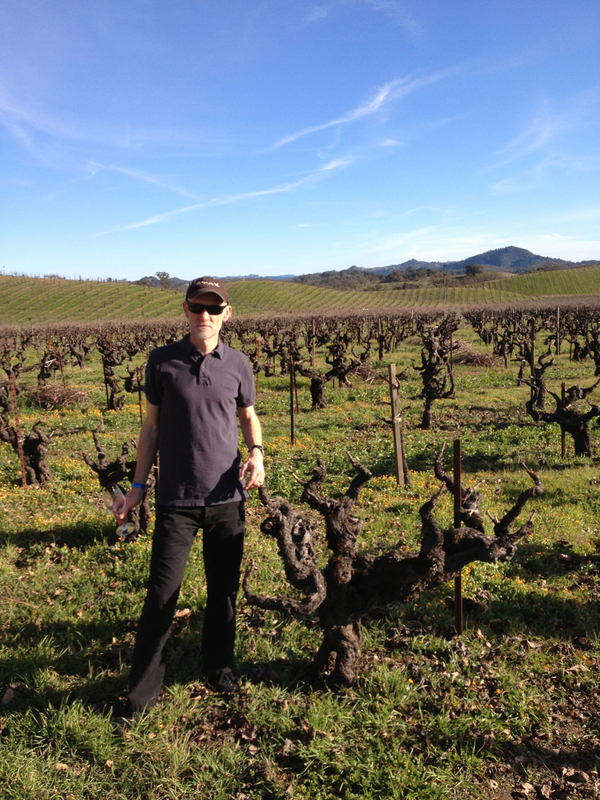 It wasn’t our first destination, but RIDGE LYTTON SPRINGS was always the number one stop on my Northern Sonoma Winter WINEland tour. My love for Paul Draper’s wines is well documented (here, for example, and here), but I am hardly his only fan. Indeed, when we arrived at the vineyard winery, located just inside Dry Creek Valley, we encountered something that had been lacking at our previous destinations, and it wasn’t just mid-afternoon tipsiness; there was significant excitement in the air, a similar sense of pilgrimage from other wine-lovers. 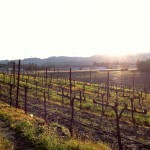 There was also a profound sense of place: Ridge owns or leases vineyards all over California, but unlike other wineries that set up shop on a main road for convenience, Ridge’s Sonoma County tasting room looks out on the Lytton Springs vineyard that produces its Zinfandel-dominated blend of the same name. (Ridge has one other tasting room, up on the Monte Bello Ridge in the Santa Cruz Mountains, close to the vineyards that produce its world-renowned Cabernet Sauvignon and Chardonnays.) The Zinfandel vines of Lytton Springs are over 100 years old; you can guess as much by the gnarly trunks that bear little resemblance to the conventionally arrayed younger vines you’ll see on most of your travels through the New World. Like any other wine groupie, I immediately posed for a picture alongside them and, after pausing to admire what was by far the greatest view of our day, headed inside for the (disappointingly limited) tasting. 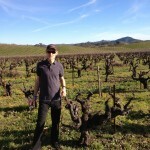 Yours truly standing alongside some ancient Zinfandel vines at the Lytton Springs vineyard, outside the Ridge winery. Among Zinfandel fans, the Ridge Lytton Springs, along with the Ridge Geyserville (produced from three adjoining vineyards in Alexander Valley, just a couple of miles further east), are the benchmarks. 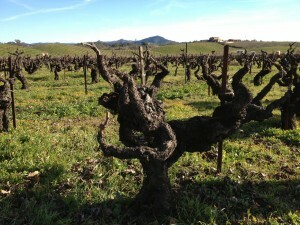 Not just for Ridge, which produces almost a dozen more Zin (dominated) wines, but for Zinfandel in general. What renders them so spectacular? Vineyard, for one thing; the Geyserville is even older than Lytton Springs, with some of the vines dating back an astonishing 130 years. 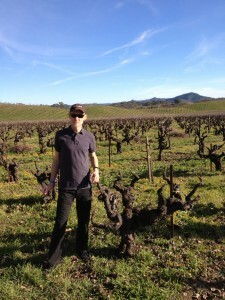 Wine-making, for sure: not only is the attention to detail quite extraordinary, but Ridge practices non-invasive, essentially organic, minimalist techniques – Paul Draper uses the term “pre-industrial” – as a matter of course. (This sustainability approach carries over to the Lytton Springs winery, which is made of straw bales and vineyard clay and is mostly solar-powered.) As much as anything though, it’s down to the fact that the Geyserville and Lytton Springs are not pure Zinfandel wines, but rather, field blends. The addition of Petite Sirah and some Mataro/Mourvèdre affords the Zinfandel tannic structure and ageing potential, and some Carignane helps softens them. The result is something close to cosmic. The 2010 Geyserville ($37) demonstrates the advantage of the field blend approach. In this vintage, the wine contains just 64% Zinfandel, this relatively low amount the result of a heat spike in late August that damaged half that grape’s crop even as it spared the southern French workhorse grape Carignane (which forms 20% of this particular Geyserville blend), the tannic Californian oddity Petite Sirah (12%), and the mutant Alicante Bouschet and the Mataro (2% each). The challenges of the 2010 vintage meant that the wine was made from very low yields, saw a later assemblage, and was aged in older oak than usual to enable the potentially subtle flavors a chance to shine, but the quality of the wine itself, certainly at this youthful stage, was typically high, judging but the rather small pour we were given. The wine showed itself incredibly lively, explosive even, with a cherry-plum profile, some clove, some mintiness, and a firm texture that spoke to the tannic structure. Geyserville, unlike most Zinfandels, can typically improve in bottle for as long as a decade; for all the problems of the vintage, this will likely be no exception. 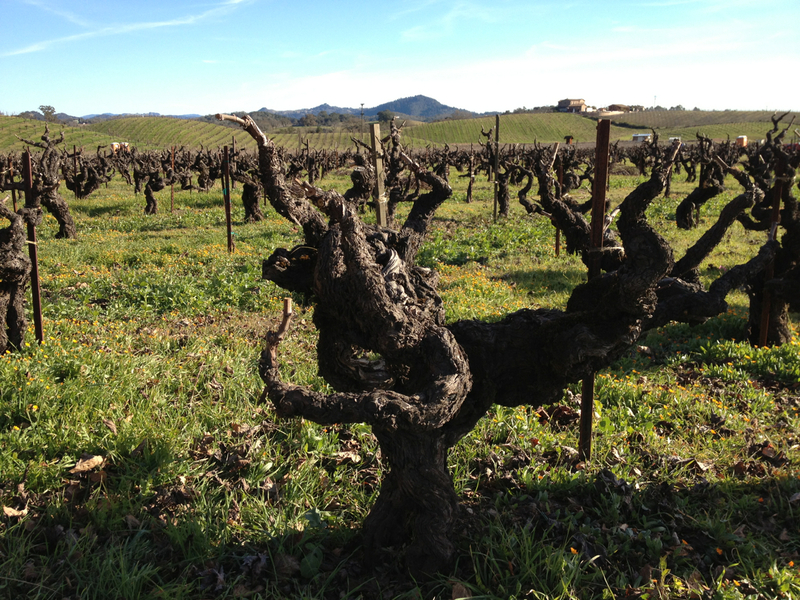 The gnarly old Zinfandel vines of the Ridge Lytton Springs. 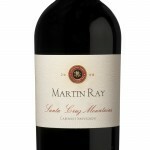 The wine of same name also includes Petite Sirah, Mataro (Mourvedre), Carignane and Alicante Bouschet. Further afield, the Estate vineyards are planted with some Grenache and Syrah. 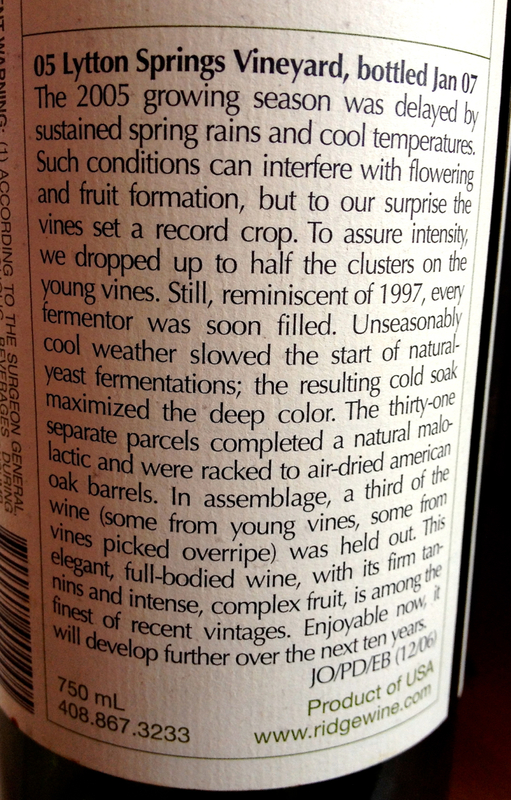 A typical Ridge back-of-the-bottle label, showcasing the winery’s meticulous attention to detail. Click on thumbnail for full-size image. After returning from California, I felt compelled to open one of the two Lytton Springs I had stored in my cellar. In contrast to the 2010, the 2005 Lytton Springs vintage produced record yields and Ridge, in their quest for perfection, dropped half the cluster on the younger vines and then eliminated a third of the fermented parcels from the final blend. (This willingness to cut out part of the crop and the overall attention to detail helps explain the relatively high prices.) Dominated by Zinfandel (77%), with Petite Sirah and Carignane making up the balance (no Mataro in 2005), the wine almost leapt out of the uncorked bottle as if a colorful jack-in-the-box. It offered licorice and tar on the nose, along with the familiar brambly fruit; on the palate the boysenberry fruit came alive, full of spice and life and zest. The tannins had softened and the wine felt like it was at a peak, the fruit still showing strong but its bottle age allowing for a delectable smoothness that completely belied the alcohol. It’s a wine that could only be Zinfandel (dominated), only from California and, at this level of quality, probably only from Ridge. A few days later I conducted a radio interview about the Smiths where I was asked, on the fly, if I could compare the Smiths to a wine. I immediately talked about them as a field blend planted by immigrants (the Smiths’ parents were all Irish; in California, it was mainly the Italians who planted these old Zinfandel vineyards and included other grapes to deal with the vagaries of vintage), whereby the whole is greater than the sum of its parts. Like the Ridge Lytton Springs, I said: big, bold, brash, perfectly balanced, somewhat unconventional, well dressed, essentially organic, clearly articulate and utterly unique. I was fortunate that the empty bottle was on my desk awaiting this iJamming! 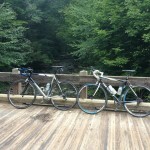 write-up while I talked. 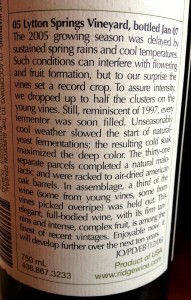 A typical Ridge front-of-bottle label. The clear, clean and distinct design is used across the winery’s entire profile of 27 different bottles. Ridge also poured us a 2010 Dusi Ranch Zinfandel, from down in Paso Robles. Produced from vines planted back in the 1920s (by Italian immigrants, yes), it’s an exceptionally exuberant Zinfandel well worth its $32 price tag and quite capable of a ten-year shelf life. The 2008 Lytton Estate Syrah/Grenache ($32) seems, on the face of it, like an over-priced Californian Côtes du Rhône, but again, it’s made with Ridge’s typical attention to detail, a meticulous blend of 110-yr old, 50-yr old and 20-yr old Grenache vines from the western part of the Lytton Springs estate, blended with an equal amount of young Syrah. I was mildly confused that Ridge chose to serve this wine last; its strengths were muted after the exuberance of the Dusi, and the small pours didn’t help. I was also somewhat disappointed that a wealthy winery that lists 27 different bottles on its web-site could only open four of them, and all from the most recent vintage. Still, if the tasting wasn’t the greatest, I at least left with my mental image of the winery intact – and my physical impressions exceeded.